I LOVED your assembly with the children. After being in education for 36 years.....YOU are the best! You inspired the students to be writers and that is what we are striving to do as educators. How fun you are with them and you understand children so well....it shows! This may have been the most successful author visit we have ever had . . . Everyone was just bowled over with your presentation. still buzzing about your great presentation and effectiveness. You have given us a renewed excitement about reading and writing. It is obvious that you enjoy kids, and are a gifted teacher. assemblies to the different age groups, and was so impressed with your organization, structure, pacing (moving things quickly along with no "dead time"), behavior management, rapport with the kids and faculty, your use of songs /poems / rhythmic whole group activities from your book, readers' theater... the list just goes on. [Y]our joy in your work shone through during the visit. You are one of the few terrific teachers who is able to manage a group of kids without assuming a pedantic manner-- very refreshing and so nice to observe. When I come to your school, I'm yours for the whole day! I do a combination of highly interactive, large group assemblies followed by classroom visits or hands-on writing workshops. By the end of these sessions, students will walk away with specific writing and revision strategies that they can apply immediately. And while I'm there, I'm happy to autograph books - either new books or classroom copies. My lively, highly interactive assemblies are accessible to all ages and abilities of students, motivating them to read, write, revise and share. I use music, costumes, props, photographs and kinesthetic experiences to engage students in “performing” stories in their seats as well as on stage. My award-winning books on bullying, friendship, generosity, perseverance and being different resonate with young audiences. 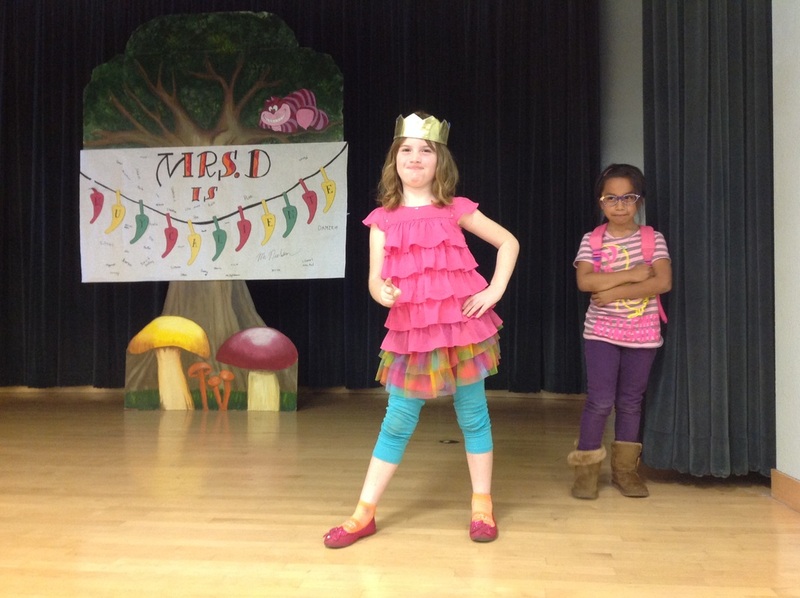 I begin by having all kids "rehearse" for a performance of The Recess Queen that they'll act out at the end of the assembly. Next, I show how a picture book is made, beginning with a technique for how to find ideas, then teach strategies for creating and revising a first draft. I emphasize the importance of persistence when learning a new skill or following a dream. In the intermediate assembly, I also demonstrate how to apply Common Core standards related to research in the “real” world of professional writing in language arts, social studies, science and the arts. This practical information on the writing process can be applied directly in the classroom by teachers and students. These assemblies are educational, entertaining, motivating and memorable. These small group sessions of up to 2 classes at a time give kids and teachers a chance to ask me questions in an intimate setting. I'm happy to answer any question they throw my way. I also show supplementary materials (i.e. book dummies, special research, a revision game, etc.) depending on the direction of the discussion. Where do ideas come from? All stories - fiction and non-fiction - come from observation and research. Using primary sources, photographs and works of art, students will apply observational, analysis and writing skills in hands-on exercises as they learn strategies for generating core content or themes for their narrative/literary and informational works. Revision is the key to clear writing. But how can teachers manage this process successfully with students? This workshop gives teachers hands-on experiences with a layered approach to revision that published children's authors use. Here are some forms and information to help you plan for my visit to your school. If you schedule me for a visit, you will receive a full Author Visit Packet stuffed with great teaching ideas and items to post on bulletin boards. This booklet is for young writers who would like to become published. It includes 10 tips for publishing success and a list of resource books about writing.